We’re proud that we played an instrumental role in developing such a highly visible, plain-language document. It has been widely accepted as a clear interpretation of complex information. The original — 6-page Personal Earnings and Benefit Estimate Statement — went to workers who were 60 years old. It was intended to give information about yearly earnings and eligibility for benefits and basic information about programs and benefits. Rightly, the government was concerned about its clarity when its audience expanded drastically as a result of the legislation. Our preliminary review uncovered a number of flaws. And, ironically, the traditional “plain language” issues of word selection, active voice, and paragraph length had already been solved, but still the document had defects that impeded readability. We rolled up our sleeves and followed a systematic plan. held intensive interviews of legal and programming staff, communication and publication personnel, customer service representatives, top managers. developed 4 prototypes and tested them. monitored results of SSA’s survey of 16,000 randomly selected people. elicited comments from agencies and organizations. 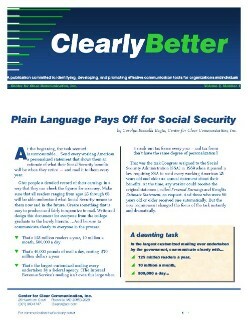 To read more, see, “Plain language pays off for the Social Security Administration“ in Clarity. 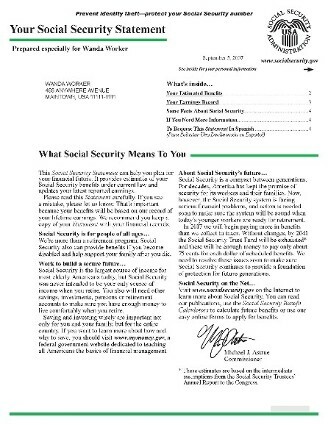 See your own Social Security Statement at www.ssa.gov. Wouldn’t you love to get calls like this? Clearly, the document has stood the test of time. Years later, it effectively gives people the information they need to make sound choices about their retirement.